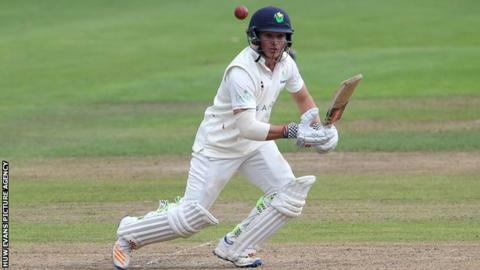 Kiran Carlson has signed a new three-year contract that will keep him with Glamorgan until at least 2020. The 19-year-old is the youngest player in county first-class history to score a century and take a five-wicket haul. Carlson took 5-28 against Northampton on 31 August 2016 on his Championship debut and 12 days later hit an unbeaten 101 against Essex. "It's great to commit to Glamorgan for the next three years and nice to have that security," Carlson said. Carlson's century against Essex also claimed the Welsh county's record as the youngest player to score a first-class hundred. He studied at Whitchurch High School, which has produced fellow Welsh sports stars such as Gareth Bale, Sam Warburton and Geraint Thomas, and is in the first year studying for a civil engineering degree at Cardiff University. "It's going to be a busy period in my life with cricket and university but I can't wait to get stuck in and kick on," Carlson added. "The hard work has already started and we can take a lot of positives from last season into next year."